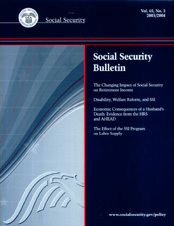 This article assesses the role of Social Security and Supplemental Security Income (SSI) in the economic well-being of baby-boomer retirees and their predecessors. The results suggest that, similar to current retirees, Social Security will account for about two-fifths of projected income for baby-boomer retirees. On average, SSI will contribute almost nothing to total income and will be received by fewer baby-boomer retirees than by current retirees. Although baby boomers can expect higher incomes and lower poverty rates at retirement than current retirees have, they can also expect lower replacement rates. The decline in replacement rates is driven, in part, by a decline in Social Security replacement rates.